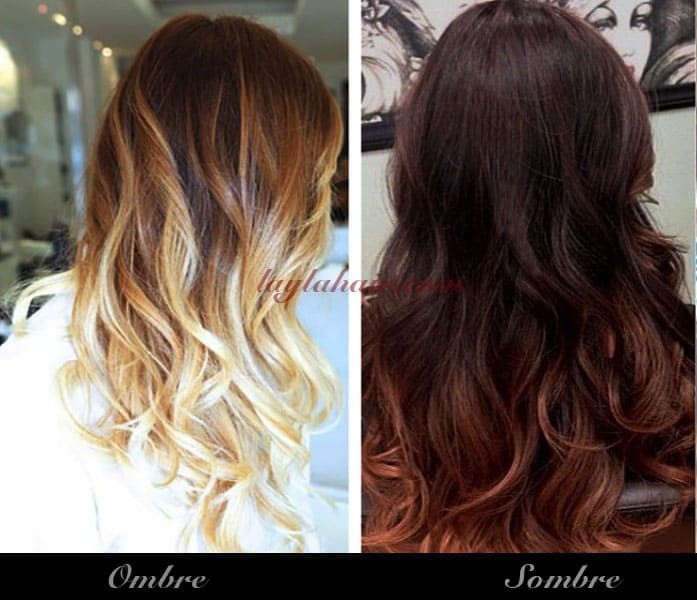 What the Difference between Ombre or sombre? Home	→ Blog → HAIR EXTENSIONS → What the Difference between Ombre or sombre? Trends come and go, but it looks like the gradient hair is here to stay. Over the past few seasons, we’ve transitioned from foil highlights and solid all-over color to softer and more natural looking dye jobs. Gradient hair color has gripped the attention of people on all fashion runways, red carpets, and even city streets. Dark haired girls who longed for having blonde hair for a while rushed to the beauty salons to Ombre their hair. Now there’re a great variety of hair dyeing techniques: Californian highlights, balayage, shatush and even strange and unusual somber. Let’s study the question thoroughly. Celebrities often choose gradient on their hair, as it looks beautiful in any hairstyle in the spotlight. All the techniques are based on classical hair highlights in which some of your locks are dyed light. Modern hair dyeing can offer you different variants of color gradation – from bright and contrasting to light and subdued. The main aim of such a technique is to create natural hair as if it is faded by the sun. The very combination of light and dark colors on your hair makes it look alive and glossy. What is ombre hair ? 1 What is ombre hair ? 2 What is sombre hair? If Ombre was popular last year, nowadays everybody talks about sombre. In this season it’s the most fashionable hair dyeing technique in Hollywood. And now we’re going to tell you what the difference between them is. Ombre is a color gradation from dark hair roots to light ends. In the middle, the line between two shades is blurred. You can ombre only dark hair (from chestnut to black one) to make the color gradation visible. Sombre is some light colored locks which create the effect of the hair faded by the sun. In this case, roots can be just a few shades darker than the rest of the hair and the line between two colors is hardly noticeable. Sombre technique can be used even on fair or blonde hair with the same effect of the play of color. When using the ombre techniques the gradation from dark to light color starts, as a rule, in the middle of your hair length or even lower. With the help of somber hair is dyed closer to the roots. The usual distance is 5 cm. Besides, we dye not all the amount of hair, but just a few locks which then create the color gradation. Ombre is a very contrasting dyeing technique. The gradation between color is quite easy to see, especially when the natural color of your hair is rather dark. In fact, Ombre looks like deep roots after blonde hair dyeing, but much more beautiful. What should you know about taking care Cambodian hair extensions? Sombre is a lighter variant of modern hair dyeing which gives a natural light color of hair ends, creating the effect of sunflecks in your hair. Unlike ombré, which worked best for brunettes in the past, sombré works for everyone. Olivia Wilde presents a fine example of balayage, while Poppy Delevingne wore them at her wedding recently. You can balayage a short pixie crop, but for best results, work it on thick, heavy hair that sits below the shoulders. Balayage is a great option if you like the look of chunkier highlights with more contrast and less blonde. Don’t dye your hair by yourself or go to the beginners or amateurs. Such techniques are rather difficult and require certain skills from the hairdresser. Such hair dyeing takes you at least 5 hours even if you have only shoulder-length hair. Be ready for it. Ombre and somber dyeing are quite expensive. A good hairdresser can charge you 25$ as a minimum.4. As any highlights, it will do your hair lots of harm. After changing your style you’d better buy special hair care products and take hair treatment from time to time. Gradient hair dyeing is a perfect variant for those who don’t like to go to the hairdresser’s very often or, for example, for those who let their hair grow. Such hair dyeing needn’t any touch-ups, as the gradation of colors is soft and light and deep roots won’t be a problem for you. They’re both highlighting techniques but create subtly different results. With traditional foils, the highlights are uniform and defined. 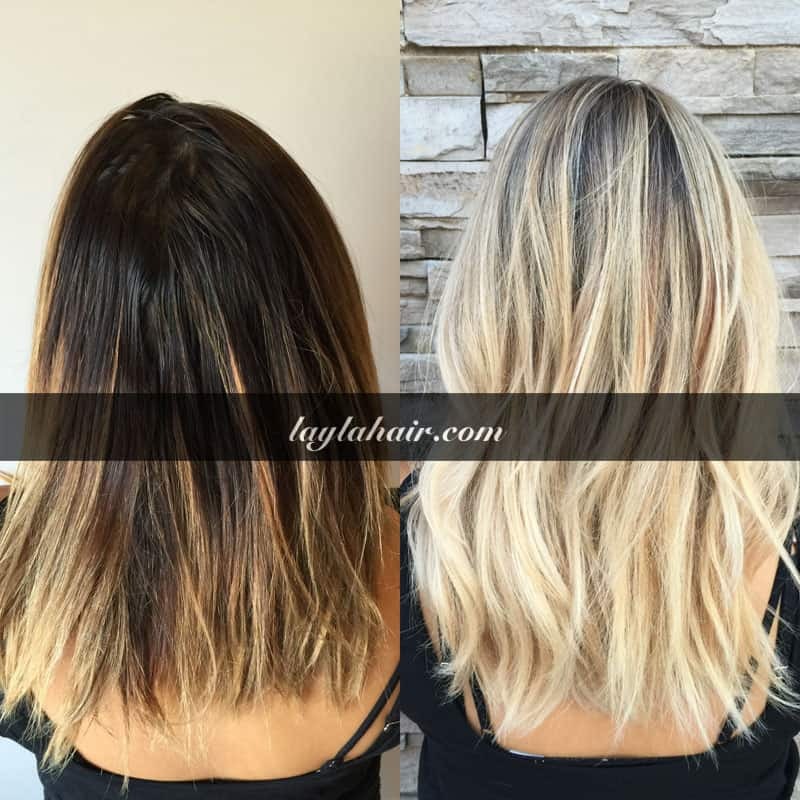 Balayage, taken from the French word meaning “to sweep”, is a freehand technique in which swatches of hair are sectioned and hand painted against a backing board with a lightening agent. After painting, each swatch covered in cellophane. As balayage highlights are less systematically placed, you end up with fatter, less symmetrical. More random highlights, resulting in a more casual, beachy finish. Hopefully, through this discussion, I can bring an overview of hair extensions to you, especially of hair color. In the near future, Layla’s team will try our best to improve the technology to supply you with various colors including cold colors group. We are so open-minded to hear all advice from customers so do not hesitate to contact us!